Service Costs > How Much Do Balloon Arches Cost? How Much Do Balloon Arches Cost? A balloon arch is perfect for entrances, dance floors, stages or even along walls. It even sets a dramatic entrance for proms, anniversary parties, birthday parties, or other special events. Balloon arches are often going to be priced by the width, height, style, the location of the venue (outside or inside) and the balloons chosen. On average, the prices for a complete setup can range anywhere from as little as $75 to as much as $600, but most professionals will have a minimum that often starts at $150. These prices would not include the additional delivery and setup fees, however. To receive an estimate, if using a professional, they will often ask for the location of the event, the setup time, ceiling height, length of the time the balloons need to float and the designs you have in mind. BalloonsAllOver.com, for example, lists a few different arches they can create, with prices range anywhere from $75 for a free-floating arch to as much as $525 for a super-sized arch, according to their official website. Balloon Brilliance listed pictures of their past work, along with the prices of each job. These prices, however, didn’t include additional delivery, setup or tear down fees. From what we researched here, the costs ranged anywhere from $190 to $600. Another company, HighExpectationsBalloons.com, similar to Balloon Brilliance, also offered pictures of their past work, with prices ranging from $275 to $500. 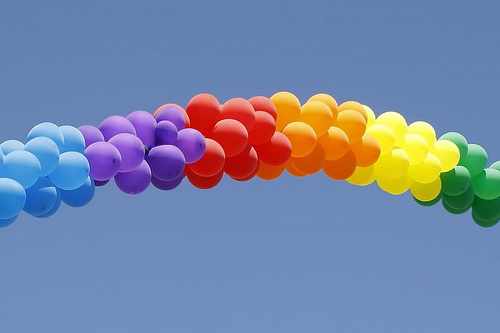 The balloon arch can commonly be a string of pearl, which is one balloon after another within a single line, or it can be packed, made of four balloon clusters that are wrapped on a single line when using helium. The packed arches may also be air-filled and created utilizing base plates, flexible arch rods and poles. Many balloon arches, when created, are often customized with someone’s name or a saying above the arches. Even though the company may refer to it as an “arch,” they can create some that appear as a square-like entrance. No matter what you’re envisioning, a good company can offer an endless range of colors, sizes and types of balloons. The balloons being used in the arches also differ. They can either be made of foil (Mylar) or latex or even a combination of both. Also, the balloons can either be air-filled or helium filled. Depending on the company, delivery, setup and tear down fees may apply, and this fee usually starts at $75, depending on the distance they have to travel, but some contractors say you should budget an additional 20 percent to budget effectively. Since most professionals have to build the arches on site, they will base this fee on the size of the job. Most balloons will stay afloat for up to 20 hours, both indoors and outdoors, but this will depend on the temperatures outside. If you were to need them to stay afloat longer than this, it could lead to an additional charge. If you don’t want to hire your own company, consider creating your own arch. Many party stores have the necessary supplies to create your own arch. For example, on Amazon.com, they have easy-to-use balloon arch kits for about $75. If you’re going to hire a professional service, make sure that you get as many quotes as possible.